A unique Drinking Water Purifier that provides safe potable water for aircraft. Elsil combines highly effective ingredients in a patented process that results in a safe, fast acting and long lasting purifier for drinking water on aircraft, protecting against micro-organisms for up to 7 days. Elsil is chlorine free and fully oxygenates the water so that your potable drinking water will have no unwanted taste or odour. The end results will improve the quality of tea and coffee served on aeroplanes as well as providing potable water that is indistinguishable from fresh water. Elsil uses new technology to adapt proven, highly effective anti-bacterial processes for use in aviation. Its key ingredient is Hydrogen Peroxide (H2O2). This chemical is already closely related to water (H2O) and the first thing you will notice is that Elsil is completely odour free so your potable water will taste just like fresh water, with no chlorine taste or smell. Hydrogen Peroxide was discovered in 1818 and is widely used in both Health Care and the water industry. Hydrogen Peroxide is supported by a trace element of Silver. Silver has been used for medicinal purposes since ancient times when silver coins were used to protect drinking water fountains in ancient Rome. The combination of Hydrogen Peroxide and Silver allows Elsil to attack all types of bacteria, spores, fungi, algae and bio-film without exception. A patented process semi-stabilises Elsil for long term effectiveness up to 7 days. This drastically reduces the volume of water used at airports as well as saving much time in managing potable water supply. Elsil attacks all known bacteria, viruses and bio films providing good clean water. Elsil is safe for human consumption with wide tolerance level (0.1 to 0.3 ml/litre). Elsil is completely tasteless and odour free. So Elsil will supply water that is perfect for tea, coffee and drinking water. Refreshments will taste just like you have used fresh water. 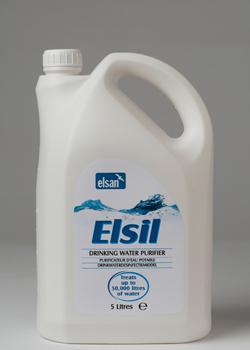 Elsil is a liquid and combines naturally with water without any additional mixing. No need to pump the tank or drive around the perimeter road for mixing saving valuable time. Easy to use from pre-measured bottles. Simply pour into the water tank at only 1 part in 10,000 (100 ml treats 1000 Litres of water). Protects water for a full week. No need to dump water and re-fill at the start of every day. Elsil can also be sued to sterilise tanks, pumps, taps and pipes on aircraft and ground bowsers. No daily changes or tank flushing – drastic reduction in your water consumption. Managed and checked by a simple dip test procedure. When preparing drinking water, Elsil is added at 1 part in 10,000. It requires a minimum contact time of 30 minutes before the water is supplied to an aircraft. After sterilisation the water is not suitable for drinking and should be dumped to drains, however, the tank does not require flushing. To check you have added the correct amount of Elsil to your water we have developed a simple dip test using special test strips. Gently wet the end of the strip, wait 30 seconds and then check the colour against the chart conveniently supplied on the side of the tube. The colour will tell you if the water falls inside the safe zone for drinking water, between 0.1 ml/litre to 0.3 ml/litre. The dip test can also check if you have dosed correctly for sterilising your tanks with a colour darker than 1.0ml/litre.